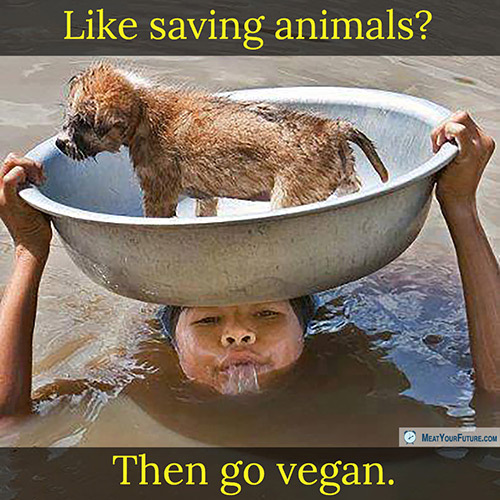 Like Saving Animals? Then Go Vegan. This beautiful picture shows what appears to be a child saving a puppy from a flooded area. It’s a heart-warming image, and shows the compassion and kindness that we are capable of. You too can save animals, every single day. How? Simply by not eating or wearing them. As a matter of fact, if you are still eating and wearing animal products, then you are directly paying for someone to inflict tremendous cruelty and death on vulnerable animals for you. Fortunately, we don’t need to eat any animal foods for our health, and we also have plenty of fabrics we can use that don’t include animal skins, furs or byproducts. And while it’s very easy for us to be vegan, it’s literally a matter of life itself for the animals if we don’t. If you care about animals at all, then please don’t support needless cruelty and exploitation against animals by going vegan. Living vegan also happens to be one of the best things you can do for the environment, and your health as well. So, it’s truly one of the most important and easiest “win-win-win” situation out there. Care About World Hunger? Then Don’t Eat Animals.